Last year I had the privilege to read excellent debut novel The Second Life of Amy Archer by R.S. Pateman (read my full review here) and so when the author asked if I would like to review the second title by his hand as well I jumped at the chance. 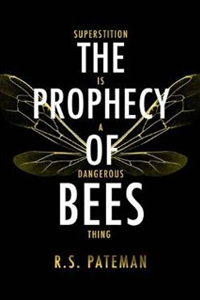 While The Prophecy of Bees also has elements of a psychological thriller and an underlying mystery, which both the main protagonist and the reader uncover at similar times, for the most part the resemblance ends there. Instead of a plot involving the loss of a missing child, this time around it is the child, or teenager I should say, that takes centre stage. Because the story is told in an adolescent voice, it balances a fine line between being an adult and young adult novel; targeting both age groups it has to ensure it's not too childish for one or too mature for the other and while this doesn't always work in fiction, in this instance it does. Izzy is horrified when her mother relocates them both from London to the countryside, far away from the bad influences that have recently dragged her down but also far away from anything Izzy has ever known, not in the least the boy she loves. Forced to change her mobile number and email address and without any transport links to escape the manor's suffocating atmosphere for a little while, Izzy feels like a prisoner in her new home and she makes sure her mother know how she feels about it. I'm usually not one for scary suspense novels because they have the tendency to creep me out, but the mystery at the heart of The Prophecy of Bees was incredibly intriguing and woven so seamlessly into the story of the moody, troubled teenager rebelling against her mother, that I couldn't help but be utterly and completely gripped and I ended up finishing it far too late at night. Reading an unnerving book just before bedtime was probably not the best idea but this novel was unputdownable, so once I started reading I couldn't not stop until I had turned the final page. The ambiguous ending is similar to that of The Second Life of Amy Archer and will undoubtedly once again divide readers between the love and hate camps, but in my opinion the story couldn't have finished any other way. Hugely suspenseful and unexpected, the entire novel kept both Izzy and the reader on their toes and the conclusion had to be of similar impact, which it most certainly was. Many thanks to the author for an advance copy of the novel in exchange for an honest review.